I’m facilitating a peer learning leadership development group for Emerging Nonprofit Leaders supported by the Packard Foundation. One of the modules is on meetings. It includes design and facilitation – and these days those are important leadership skills. But often we forget to add the secret sauce: how to participate in meetings with impact. 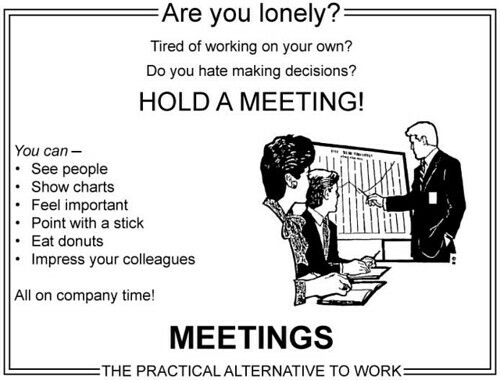 There is lots of advice out there about how to design and facilitate meetings. In fact, I just wrote a post summarizing some of the most recent research on the topic. So much of our work life is being in meetings, but many times are a participant, not the meeting leader. What can we do as a participant to make meetings more productive? Your mindset influences your behavior and participation at meetings. Have we become so complacent about the meetings we attend that we tune out, don’t prepare, and complain about the experience afterwards. Yes, there are a lot of terrible meetings – agenda less, scheduled for no reason, poor facilitation, lousy prep and follow up, technology glitches – and the reasons go on. But, you are the only person around the table or screen with your expertise, interests, concerns, and point of view. If you don’t share it, the group misses out. Practice Mindfulness Meetings: Be fully present at every meeting, focused on the conversation at hand. This type of meeting participation is called mindful listening and has four elements: paying attention, having patience, being nonjudgmental, and choosing to listen for something in particular. The quality of listening and attention in the room shapes the quality of the conversation. Remove Distractions: Multitasking is a distraction – both for the person doing it and to the other people in the meeting. The late Clifford Nass, coauthor of a Stanford study on multitasking, found that it wastes more time than it saves. Second, if your nose is buried in your mobile phone or laptop, you will miss the subtleties in what people say and the nonverbal cues in how they say it. So, stop answering email while you are supposed to be listening during a meeting. Have Patience: Set aside impulses to interrupt or jump into a conversation. You need to wait for other people to finish their thoughts – there will be plenty of time to make your comments. How many meetings end up wasting time because people were over talking and interrupting each other? Having patience means that you honor people’s pauses, don’t step on them. Wait and see if the person has more to add. Don’t Judge: This one is hard because it can get in the way of understanding others. Be curious and remind yourself that other people’s views are important. When judging thoughts occur, set them aside and refocus on listening for clarity. Become more aware of your own body language and facial expressions too – because you can telegraph disapproval non-verbally. Systems Listening: Don’t just listen word for word, but take a meta view. Listen for what other people care about, the value being created in the conversation, for what you appreciate about the person, or for what is not being said. This listening skill will help improve your skills as a meeting leader, so you should have extra incentive to practice. Compute Your Air Time: Don’t dominate the meeting. A quick rule of thumb is to do the meeting math. Divide the number of people by amount of meeting time. That’s your air time, try not to go over it. Relevancy: This is pretty simple. If what you have to say doesn’t add value to the meeting conversation, don’t say it. Effective people are not compulsive talkers! Learn to recognize when you might have something more to share, but it simply doesn’t add value. Look Out for Others: While this is the role of the meeting leader, it is a great way to contribute productively to meetings. What if you gave attention to trying to improve everyone’s experience at the meeting? Some simple ways to do this: if someone is interrupted, ask them to finish their thought if the leader doesn’t do it. If you feel the group has skipped over what was said, invite the person to restate it. If the group gets stuck, help it get unstuck. I keep wondering what would happen if we hit the pause button before a meeting got started and discussed how to participate with impact and encouraged everyone in our organization to follow these guidelines – would this make meetings more effective? What if we all took some responsibility for making meetings have more impact as participants? What are some ways you do that at your nonprofit? Empowerment is one of the important factor. In meetings one need to think what can you give to the management, instead what management asks. In this post she mentioned good points that one need to consider for the progress. This is well said! Something I’ve been trying to work on is scheduling a meeting for the exact amount of time I think it will take, even if just 10-15 minutes. Otherwise, I think we subconsciously stretch meetings to fill what the clock says. Jay: That’s what happens! Also, when you state up front that you hope to end early, there is no guilt or awkwardness at the end.